We like to be naive. It makes us feel good. If someone did something bad we find a way to rationalize it, to "explain it away" and this makes us feel safe. It was not really their fault and therefore we do not really have to worry about it happening again. But instead of using a defense mechanism we would be far smarter and wiser if we used defense: Self defense rather than false defense, Real defense rather than defense mechanisms. When interviewing old war criminals, War World Two Nazis in various countries, not only Germany but also Hungary, Ukraine, Croatia and others, we hear the same message: No guilt, no remorse, no regrets. We would hope to hear apologies, we would hope to hear remorse, but we do not. We see people who truly believed in what they are doing. The only reason these kinds of people are not doing today what they did in the past is because the climate is not yet right. They are waiting for the economic and political and social climate to change and to find a receptive audience to their message. The families of escaped, convicted, and executed Nazis continue, in many cases, to provide help to those hiding from the law and justice. For years the family of Dr. Aribert Heim and others secretly assisted the fugitive while denying all knowledge of their whereabouts. We remain naive. We feel safer believing that evil is a thing of the past, that those who perpetrated terrible crimes where duped into it or did not fully understand what they were doing, but they did. They understood then and they understand now. And they feel no remorse. Evil walks beside us. We must be prepared. Defense mechanism or real self defense, the choice is yours. 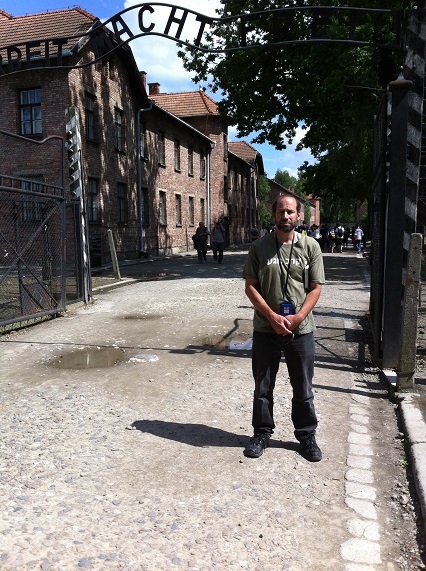 Moshe visiting Auschwitz where many of his relatives were killed by the Nazis. They have no remorse. We can never forget. We must become the solution in order to avoid another Final Solution.